Having happy memories of what happens in a sisters’ congress, the sisters all looked forward to get together as a Priory. What a sight to behold when the sisters exchanged pax hugs and greetings of peace. Sr. Lydia, our Sub-prioress and her preparatory team planned the activities months before to ensure a unique and unforgettable experience for each participant. Mother Adelaida, OSB, opened the congress before supper time on October 3, 2013. The sisters were grouped according to colors during the meal. They were also made to memorize some sentences and significant phrases from the “Porta Fidei” as a means to unite their group. 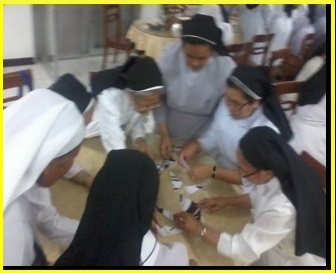 Sr. Martha, started the games for the night by letting the groups complete a puzzle of the logo of the Year of Faith. The first three groups who completed the puzzle were declared winners. Throughout the rest of the evening the Sisters played games. All were winners especially during the Special Bingo time. 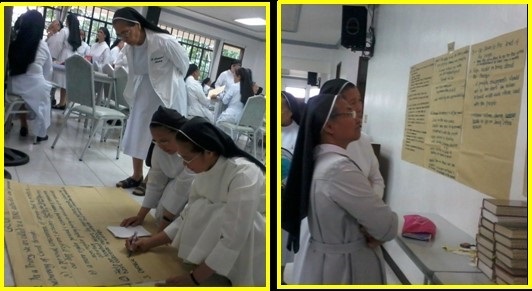 The Tacloban community prepared the cards in a way that the Sisters remember former superiors, name of stations and other information about our Priory. Special prizes were also given for example: for the one who is oldest in profession years. 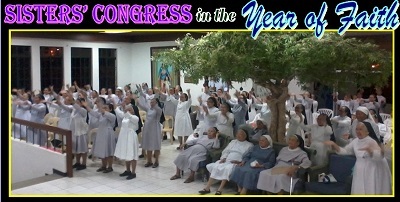 The candies, chocolates, tote bags, key chains, herbal teas, etc., prizes donated by the different communities gave much joy to the Sisters, who all won not just once but as S. Constance put it…”won as many as you could.” Sr. Ma Gabrielle and Sr. Eliza rendered a song and the Angeles community also performed a dance number. The “HALLELUJAH Prayer” prepared by the Mati community ended the night gathering. The morning of October 4, 2013, began with the Eucharistic celebration of the 50th year of Religious profession of Sr. Mary Rose Zamudio, OSB. A common breakfast to celebrate the feast followed. All feast day and birthday celebrants during the days of retreat were “formally” greeted. The Tagaytay community prepared chocolates and special orchids for the celebrants. Mother Adelaida started the day by remembering Pope Francis’ feast day which was on October 4th. She emphasized the significant role of the Pope during our times whose call is for the updating of the structures of the Church. With a great smile, she also thanked the Sisters for being “good” because it is now her 9th month as prioress but she has not encountered any problems with the Sisters. Mother Adele shared about Management and Leadership during the congress. She gave stress to the continued call to conversion as Benedictines. With the situation of our time as becoming more secularized even some groups are having “Sunday Assembly without God.” She pointed out the significance of choosing what is meaningful in one’s life. She echoed the message of Pope Francis through his life witness to “live with the people, reaching out to those who have been hurt.” She further said that “knowing the Creed is not enough” but “to be authentic witness that includes the cross” being what we preach and by being MORE. Sr. Lydia, OSB closed the Sisters’ Congress with words of inspiration and thanked the Sisters for their generosity in giving time and importance to the Sisters’ Congress that highlights the Year of Faith.